Underground construction is more complex than ever. Demand for space is increasing, new technologies are constantly evolving, and more stakeholders are asserting influence. Yet one of the most challenging and frustrating characteristics of underground construction remains: often, contract language does not account for the unique nature of building underground. 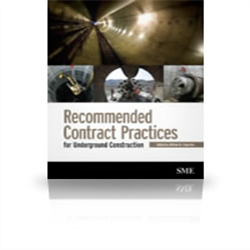 Recommended Contract Practices for Underground Construction is the first industry-wide effort to improve contract procedures in more than 30 years. This manual is an indispensable resource for contractors, consultant, suppliers, and owners anticipating underground projects. The authors suggest better practices during all stages of a project, when decisions are made that can affect the contract positively or negatively. Part one focuses on the practices and disciplines that build the foundation for effective contracts during the early phases of a project. Part two discusses best practices for contract provisions, payment mechanisms, and dispute resolution. By following these recommendations, you'll reduce the mistrust and costly disputes that often arise from the contract process. The results will be improved relationships, better contracts, and, most importantly, projects that are more cost-effective for owners and more profitable for contractors.